Are you tired of the constant battle to keep your aquarium looking good when your fish eat all your plants? Artificial plants can look better than you might expect and are certainly worthy of consideration. There are some specific issues you'll need to think about when choosing them, but they can make a useful contribution of a healthy and attractive aquarium environment. When it comes to aquarium plants, there are two basic choices: plastic or silk. Always buy your aquarium plants from an aquarium shop - never use artificial plants intended for decorating the home, as these may contain toxins that can leach into the water and harm your fish. Silk plants are usually the most attractive and have the advantage of being very soft to the touch, so they're a good choice for non-scaly fish and others with vulnerable skins. They also sway attractively with currents generated by your pump and filtration system. They come in a wide range of shapes, colours and patterns, allowing for plenty of variety, but they are often quite expensive. Plastic plants are cheaper and can work well in most aquaria. There are an increasing variety of styles available. When you buy them you should always check for rough edges left by the moulding process - you can soften these with a metal nail file so that they don't scratch your fish. 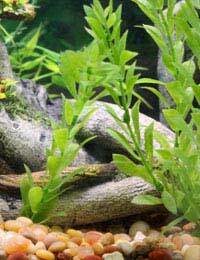 Plastic plants are popular with fish like loaches because their extra rigidity makes them good for use as perches. In many ways, artificial plants present fewer problems than real ones. Once they're in place they will stay there and you won't need to worry about inadvertently introducing parasites when adding new ones. They can get covered in algae from time to time (real plants have various defences against this) but if you are attentive then this won't be a problem as you can simply take them out and clean them. When switching from using real plants to using artificial ones, however, it's easy to underestimate how much the real ones have been doing to keep your aquarium in balance. You should check your water quality frequently to make sure nitrates don't build up. You may need to reduce the amount that you feed to your fish. Vegetarian fish or invertebrates who ate a lot of plant material may need their diet supplemented with algae discs or similar foods. Many species of fish find plants essential when spawning. Provided that your fish are not nest-building species (who would need to be able to take plants apart to use them for construction), artificial ones should work just as well. Silk ones are best, or broad-leafed plastic ones, as these reduce the risk of skin damage when your fish dart among them and press against them. Using artificial plants for spawning means that it's easy to maintain a clean environment for fry, who will enjoy having plenty of places to hide among them. Some fry prefer shallow water, in which case you can clip plants to size (taking care to avoid creating rough edges) or simply leave them sticking out of the water without having to worry that they'll die as a result. Whatever the reason that you choose to use artificial plants, you'll find that they can work very well in the aquarium. They're a particularly good choice for beginners who want to keep things simple, but experienced aquarists will find many great surprises in store when rediscovering their potential. Use only food grade plastic in the aquarium. Taste test your plastic plants first. Just wet a finger and rub it on the plant for a few seconds. Taste to test. If it leaves a bad taste in your mouth imagine how your fish will feel! No taste, should be OK.Same applies to hoses etc. After many years using real plants,I now use artificial ones as they are mucheasier to maintain and cheaper in the long run,as a pensioner on a budget I find the best option for me.As for cleaning them I soak them over night in a bucket with bleach in it.